What an awesome group of potato planters we had on Saturday. They popped in 12 rows in about 45 minutes and had Jim sprinting down the rows making trenches to keep ahead. That left plenty of time for the kids to gather on the lawn to teach our new ducks how to eat grass.We followed that activity with making big salads with lots of trimmings. Thank you so much to all who participated. Are you looking for some unique foods for Thanksgiving? Many folks visit our booth at the Farmer's Market and remark, "Oh, I drive by your farm all the time!" It makes me wonder...what do these people think when they see us out in the fields doing our various tasks that all add up to farming? One of the weirdest sights must be when we swim for potatoes. To harvest a small batch of potatoes, all you need is a pitchfork to loosen up a plant or two. But when we harvest for the CSA or market, we pull up dozens of plants at a time. And a pitchfork is too slow. To dig up part of a row, a lifting blade is attached to the back of the tractor. We drag the blade through the row and it undercuts and lifts the plant and potatoes up near the surface of the soil. Now, in a perfect world, the potatoes would fall neatly into a little pile and we'd collect them in no time at all. 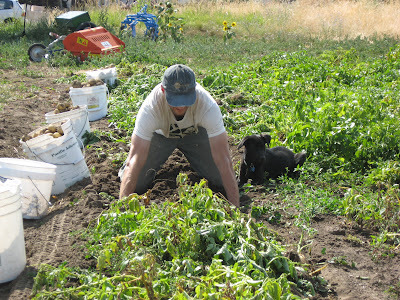 But this is farming, and "perfection" comes around once and a while, but with potatoes we've still got to do some work. So we go swimming.